It seems that obesity is sweeping the Western world in a terrifying, gelatinous tide. This phenomenon even has its own word these days: globesity. 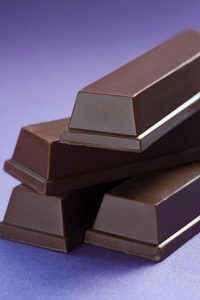 Six months ago, the Food Standards Agency (FSA) called for a reduction in the size of chocolate bars to help tackle obesity. Perhaps in defiance of this move, it seems that if you pop into any supermarket or petrol station these days, you’re likely to find larger versions of popular confectionery brands newly adorned with tempting and justifying vocabulary. For example, it’s now possible to buy a bar and a half of Cadbury Dairy Milk; the Kit Kat is feeling rather chunky these days (like its regular consumers, no doubt) and your average Lion Bar now comes with extra bite. All these products are trying to tell us that they’re BIGGER. Not bigger in a ‘50% free’ kind of way, nope, patrons are expected to PAY for the extra calories, fat and sugar! Each slogan, however, is carefully phrased to reassure us that it is morally and nutritionally acceptable to consume this oversized treat, usually with the implication that we ‘deserve’ it. Similar euphemisms can be seen on crisp packets. Quavers Crisps now come in a big eat grab bag, presumably making it easier to pick up for those with fingers the size of sausages from pigging all those earlier bags! And do the people who buy Doritos in a share size actually share do you think, or do they scoff the lot down themselves? I too have fallen foul of these inviting euphemisms. I’ve been known to slink off to buy myself a Mars Duo on a particularly depressing Monday afternoon and I have calmly paid, munched and watched the calories march straight to my hips. I kid myself that having a Duo does not equate to doubly pigging out, since it doesn’t actually cost twice the price of a single Mars, and so I feel I’ve somehow netted myself a bargain. Admittedly, this is a very clever use of language by confectionery manufacturers and it could well catch on in other areas. Perhaps those huge, gas-guzzling 4x4s we all love to hate will become a car and a half and thereby somehow seem less noxious. And if the mansion over the road becomes share size can we all move in? I haven’t yet managed to spot the latest incarnation of the Twix, which perhaps represents the origin of the ‘bigger is better’ mentality. I can remember the ads as far back as the 1970s; some poor kid stands there, head hung low over his limp, empty wrapper as the Twix kid in the foreground smugly tucks into his second finger of delicious chocolate, biscuit and caramel. One wonders how much that kid weighs these days…. Anyway, let me know if you see a Twix, I’m dying to know if they’ve gone for a four-fingers approach or have just extended the existing two to the length of javelins. And the slogans? I’m going for ‘Twix, more 4 you’, or ‘Twix – full lengther’. Ah yes England may be small in size but, when it comes to treats, we’re right there with our gigantine cousin America. What I’d really like is one of those energy bars in a super size. Your Blog post exceeds in creative writing more than the “very clever use of language by confectionery.” It sounds so delicious as a “Twix”. Crunch! I’m off to the supermarket! Nice going Beth, you make it harder to stay off the choccies though!! A while ago, confectionery products such as Mars, Snickers etc started being sold in mini-versions called “Fun Size”, if I remember right – but sold in bags of multiples, rather than as individual tiny bars. Great for the waistline if customers share, and find that “one is fun”, but I doubt if that’s what happens. However, it’s interesting that the company opted for a name for the product that didn’t directly refer to the smaller size (unlike the supersized ‘bar-and-a-half’, ‘chunky’ etc), unless “fun” as an adjective is intended to suggest something trivial and ‘light’ rather than substantial and weighty.